When planning baby G's nursery I had in mind a striped wall, as mentioned here. I'd had done it before in the Powder Room and L's Room with excellent results. So it made sense to go safe and do the same for an accent wall in this room. Since the winner mood board was the giraffe theme/yellow-grey combo, I was thinking yellow stripes. Somehow in the process, I don't remember exactly how, I changed my mind. I decided I wanted a chevron (or zig zag) wall (we should take in consideration that besides stripes that is the other pattern I'm obsessed with. I sewed some green chevron pillow covers for the living room that I'll show you sometime soon). 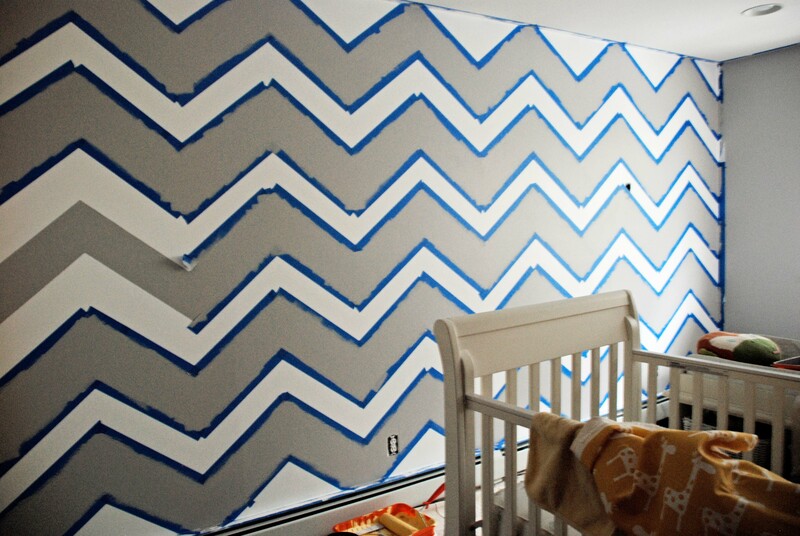 My plan started with a yellow chevron wall on the north wall, which will be the background of the crib. I drew the size of the wall in Autocad and started drawing the pattern until I found a scale that I liked. I then printed one of the triangles of the pattern full size and transferred it into a piece of cardboard so I can have a template. (Sorry no pictures. I'm very bad at documenting these processes). Next step was to draw horizontal lines on the wall (according to the size of the pattern) so they can be the base for my template. The truth is I got lazy and just started to draw the pattern on the wall, placing the template, drawing, then placing the template next to the one I just drew and so on. It seemed to be working until the mister pointed out that the pattern was a little crooked. So I had to verify the height of some of the triangles with a measurement tape to make sure they were aligned. Once I had the pattern drawn on the wall, the fun part started. I taped all the wall, and then the mister proceeded to paint it. I'm glad I reconsidered the yellow and decided on grey for the chevron wall last minute. We love, love how the wall turned out. 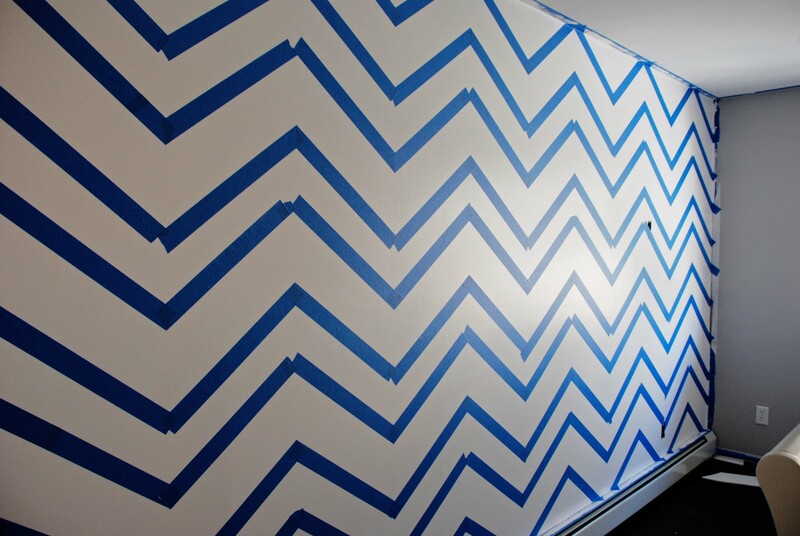 Even though we chose grey for most of the walls in this room, the chevron pattern makes it feel playful. I can't wait to share the final results. Stay tuned! hello! I just found your blog while searching nursery ideas! LOVE your cheveron walls. i was thinking to do this on my ceiling in yellow. you made it look easy! I love how the grey turned out too. good luck with your delivery! Love the walls. What color gray did you use? It's lovely.